ENJOY THE SERENITY OF PINE FOREST! 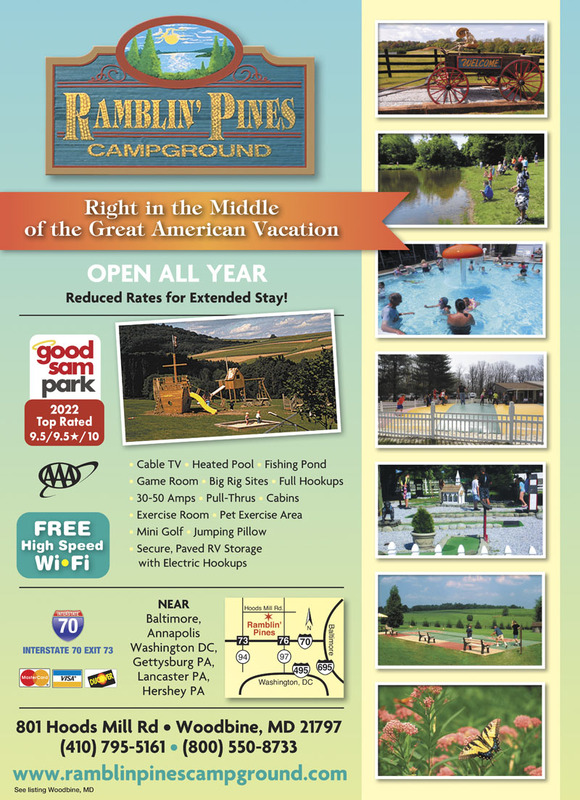 Ramblin' Pines is a family campground nestled in a quiet, peaceful wooded setting and located in the center of the Washington-Frederick-Baltimore vacation attractions. Nice campground and close to I-70. Sites are big with plenty of room to stretch out. 30-45 minutes to the Inner Harbor is nice too. Showers and bath houses were clean. Pool was very nice. The staff was very nice and run a tight ship. Always someone on a golf cart roaming around making sure the residents were being take of. Prices were ok. I am amazed that none of the other reviews have mentioned the rock quarry! We were there W-Sunday and the loud noises of trucks and loaders and backup beeping started early every morning. I normally sit and listen to birds and nature with my coffee on RV trips. The first morning, I initially thought there was annoying construction going on nearby. As we investigated, we discovered the campground borders and full-blown quarry! I thought at least on Saturday I would get some peace and quiet but nope, that darn quarry is even open on Saturdays. The restrooms were clean; no complaints. The activities were wonderful; the bounce pillow was fun. The owners were super nice and my kids enjoyed the crafts put together. It is such a shame that it borders the quarry. I don't know if you had a spot close to the office- maybe you might not hear it so much. The poor tenters on the far end bordered the quarry. We were in the middle and definitely were bothered. We stayed for Halloween weekend and had a blast! My kids loved the hayride, haunted trail, and trick or treating! This is the worst campground I have been to. When I arrived they put me in a temporary site. The next morning the owner was yelling at me from the road because I could not move to a different site until after I got out of work that evening. I was relocated to a horrible site. Absolutely no sun light, you couldn't spend time outside because the bugs we so bad and the wifi was really weak up in the woods. The cell signal and 4G were blocked by the trees. The owner was rude, disrespectful and a complete jerk. We were there in the rain and still had a great time. We'll definitely be returning. Everyone was very nice, lots to do on the well maintained grounds!!! The gentleman at the front desk and the staff seemed friendly. Had a small arcade and pool table in a recreation area. It was cold outside during my stay but saw some children playing on a giant bounce pillow. Only complaint is that if you are out after their business hours to get back in with your vehicle you have to put a cash deposit for a key card. The deposit is $40. All in all a nice place and already talking about going back there. Great campground for kids, can handle big rigs and has separate tenting area, lots of trees and shade, but also an open area available. Plenty of kids activities, like jumping pillow (huge), pool, weekend hayrides, and special Halloween weekends in October, frequent weekend activities like live music in summer. We like it so much we bought a permanent site. 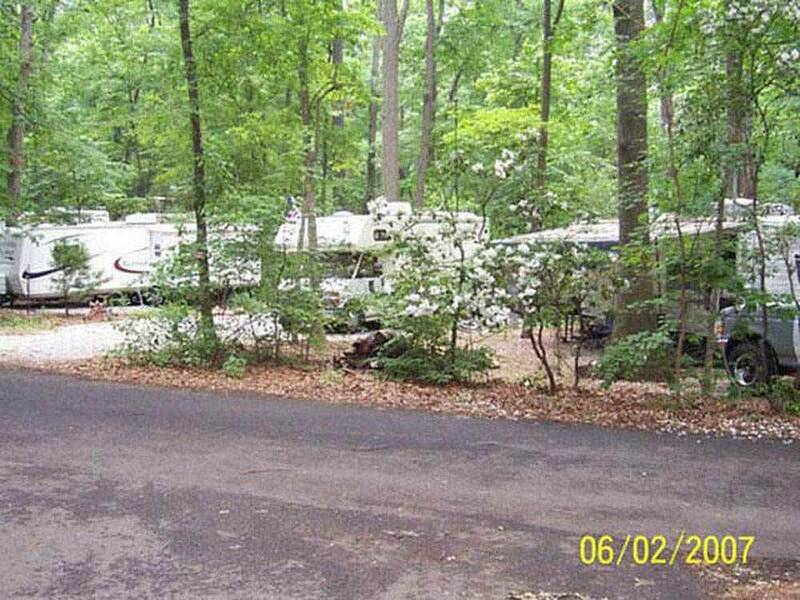 This is our favorite campground when we're in the DC/Baltimore area to see our grandchildren. It's a clean, well-run park. Most sites are heavily shaded which is a problem if you use satellite TV. However, you can get a satellite fix from some of the "FR" sites. The biggest downside of this park IMO is that it has a really expensive guest policy. Just having our kids and grandkids visit to have dinner costs us $5 each every time. I think that's a bit steep. Discover history from this base camp close to the monuments of Washington DC, less than 60 miles to Gettysburg, PA and many Revolutionary War and Civil War battlefields.